Icing isn’t just something that happens in winter storms or hockey games. It’s the term used when internal combustion engine (ICE) cars park in spaces reserved for charging electric vehicles, thus “icing” out their environmentally friendly counterparts. 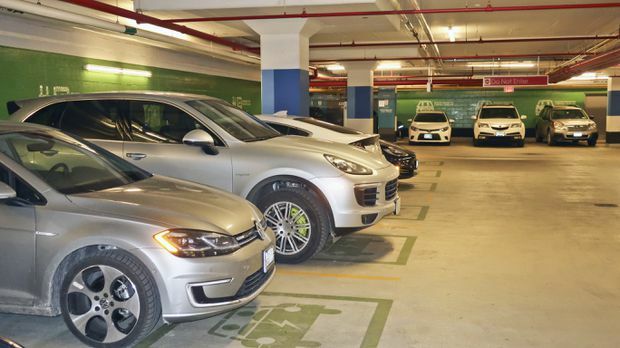 It can be the source of heated arguments and it’s just one of the challenges facing managers of parking garages as electric vehicles become a growing phenomenon in cities across Canada. “Charging stations are expensive to install, and as electric cars become more prevalent, there are more people clamouring to be able to plug in while they park. We’re having to set up special zones in garages,” says Bradley Jones, head of retail for real estate giant Oxford Properties Group of Toronto. Oxford has launched a pilot program to test different rate structures at two of its properties in Toronto: the RBC WaterPark Place tower at Queen’s Quay near Bay Street and the MetroCentre Wellington Tower west of the financial district. Another challenge is making sure EV owners move out of a stall when their car is charged up, so others may plug in. “We don’t want people occupying a charging stall and leaving their car there all day. That means enforcing time limits and it can mean having attendants to monitor EV parking and overtime fees to ensure cars move when they’re topped up,” Ms. Kohn says. In Oxford’s pilot program, EV owners pay a flat $5 fee to hook up in Level 2 spaces. If they stay overtime after the charge is complete, it’s an additional 15 cents a minute after a grace period. An app on their phones tells the owner they have 15 minutes to go down and move to a regular parking space. “Where we have Level 3 chargers, we charge $15 and it’s a 30-cents-a-minute overtime fee. It’s equivalent to what we found is being charged in Vancouver and California, where EVs are common,” she explains. “When we talk to peers in other cities in Canada and the United States, no one has yet come up with what they consider a perfect procedure,” Ms. Kohn notes. An approach some garages use is to make the EV charging zone a valet area, where the cars are monitored. There are indicators on the plug that go dark when the charge is completed and the valet then moves the car. The hookups can be complicated because in the past, parking structures weren’t wired for high voltage power. So far, the 20 spaces allocated for charging at WaterPark Place have kept up with supply on average days. “We researched and found 80 per cent of time tenants do most of their charging at home so we’re offering a service to them if they need it. If people are planning to drive to the cottage [after work] or they’re going on a longer drive, they are more likely to want to charge while at work,” Ms. Kohn says. Setting up public charging hubs that are the equivalent of gas bars may happen in the future. And as surface-level parking disappears to development in growing city cores, these may have to be located in parking structures. “We get pitches from companies that want to set up public charging hubs in our garages. We don’t see much demand at this point for people who aren’t tenants wanting to stop in for a charge. However, as EVs become more common, there will likely be more owners who don’t have garages or chargers at home and will be looking to charge at public lots,” Ms. Kohn predicts.